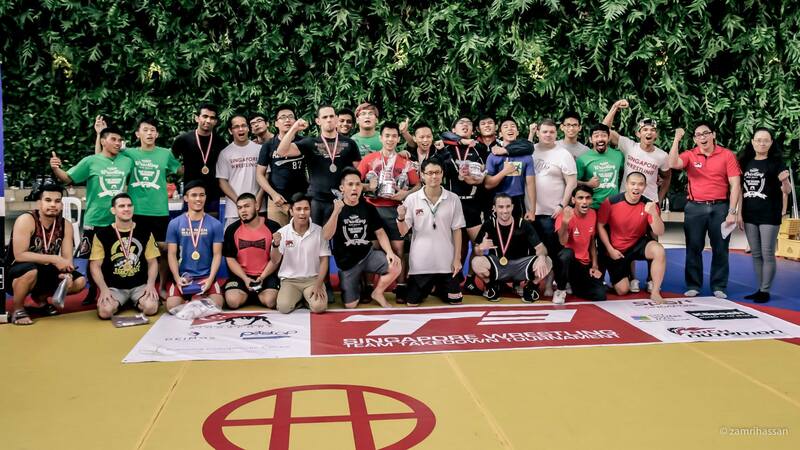 Want to find out how to win at the upcoming Team Takedown Tournament? Each team match will last a maximum of 10 minutes with each bout lasting a maximum of 2 minutes with exception of when a bout has been won due to a 6 point lead or a pinfall. T3 will be contested in a Tournament pool format, where teams will be split into 2 pools competing in Round Robin within the pool and with the top 2 teams of each pool advancing to the Semi-finals. There will be a maximum of 5 competitors per team, one competitor per weight category and a maximum of 5 bouts per team. Winning 3 out of 5 bouts will determine the winner of the team match which will then proceed to the next round of the competition. Before the start of every match, the referee in charge will do a random draw to come up with the bout order for the match. E.g. 53214 or 34125 or 12345. In the event that there are less than 7 teams, T3 will be contested in Round-robin format and all the team bouts will run until the team match is completed. Total victories will then be used to decide the final winning teams of the tournament. In order to win, a competitor must either attain a 6 point lead advantage or by *pinfall. If no action or pinfall is established within 10 seconds of ground play, both competitors will be stood back on their feet and the match will resume from the centre. Take downs (Falling on the back past 90 degrees) – 2 points. Stepping out of bounds (contest area) in stance – 1 point. 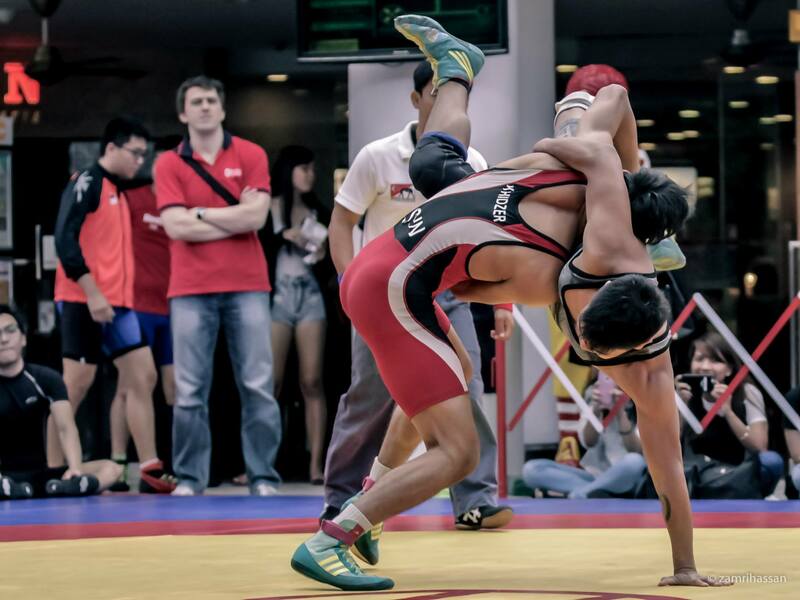 While on the ground, first back exposure to the mat is considered a takedown. No points will be awarded for reversal of position while on the ground. If the score at the end of the bout is 0-0, it will be a draw. If the score is 1-1, the last competitor who scores is the winner. For any other draw scores, the manner of scoring the points will determine the winner. E.g. 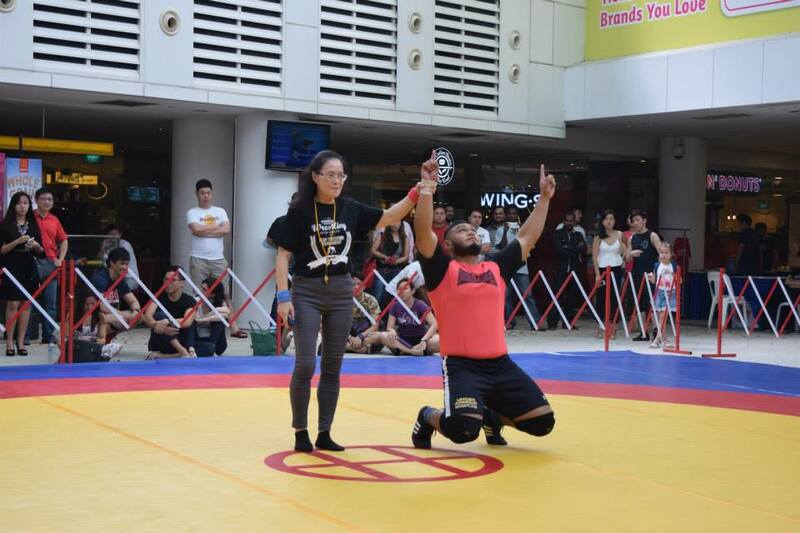 In the case of 2-2, Competitor A scores a total of 2 points via a 2 point takedown while Competitor B scores a total of 2 points via 1 push out and 1 back take, Competitor A wins because his manner of scoring points is superior. *Pinfall - Controlling the opponent on the mats with both shoulders pinned down to the mats. *Taking the back – Only counts for points if the opponent has at least 3 point contact on the ground. No additional back take points will be given if a take down has already been scored. Substitutions may take place only outside of match time. A maximum of one substitute team member is allowed per weight category per team. Substitution is allowed only once per weight category throughout the entire competition. In the event of an injury, the competitor will be given 1 minute of injury time to be examined by the first aid crew on duty to decide if he is fit to carry on. If he is unable to carry on competing, his bout will be forfeited. The substitute team member (subject to prior registration) will be allowed to compete in place of the injured competitor only in subsequent matches.